StarTech's new family of Thunderbolt 3 adapters that let one TB3 port to drive two 4K 60Hz displays are now available for sale. One of the adapters supports two DisplayPort 1.2 outputs, whereas another features two HDMI 2.0 headers. The devices are bus powered and do not use any kind of image compression technologies. When Intel introduced its Thunderbolt 3 interface two years ago, the company noted that one cable can drive two daisy chained 4Kp60 displays using one TB3 cable - as TB3 can carry two complete DisplayPort 1.2 streams - greatly simplifying dual-monitor setups. The reality turned out to be more complicated. At present, there are not a lot of displays supporting Thunderbolt 3 USB Type-C input along with an appropriate output to allow daisy-chaining another monitor. Makers of monitors are reluctant to install additional chips into their products to save BOM costs and keep designs simple, essentially concealing one of the features of the TB3 interface. Meanwhile, each TB3 controller supports two DisplayPort 1.2 streams, so to drive two 4Kp60 displays, some PC makers even integrate two TB3 ports into their ultra-thin laptops to support two 4Kp60 outputs, whereas others go with four. The new adapters from StarTech solve the problem and get two DisplayPort 1.2 or HDMI 2.0 headers from a single TB3 connector. Earlier this year StarTech introduced two devices: the Thunderbolt 3 to Dual DisplayPort Adapter (TB32DP2T), and the Thunderbolt 3 to Dual HDMI 2.0 Adapter (TB32HD4K60) for customers with monitors featuring DP or HDMI inputs. StarTech does not disclose much about internal architecture of the devices, but I understand that they feature a Thunderbolt 3 controller that “receives” two DisplayPort signals from the host via TB3 and then re-routes them to either two DP outputs or two HDMI 2.0 outputs using appropriate LSPCons. Moreover, the TB3 to Dual DisplayPort adapter can even handle a single 5K monitor by using both outputs. The new adapters are compatible with Apple macOS and Microsoft Windows-based PCs. Meanwhile, one thing to keep in mind is that the adapters do not support DP or HDMI alt modes over USB-C and they can only use TB3 ports. 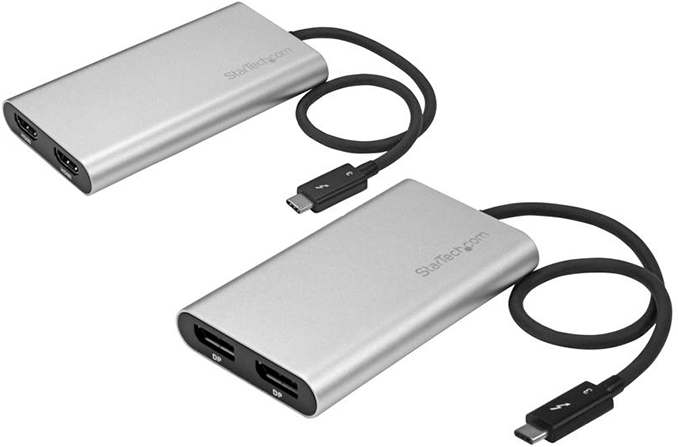 The StarTech Thunderbolt 3 to Dual DisplayPort Adapter (TB32DP2T) is now available either directly from StarTech for $99.99 or from Amazon for $77.97 (a limited time offer, I suppose). Meanwhile, the Startech Thunderbolt 3 to Dual HDMI 2.0 Adapter (TB32HD4K60) is slightly more expensive, it can be ordered from StarTech for $134.99. Update 10/19: The Thunderbolt 3 Dual HDMI 2.0 adapter is now available. Well this is not much different than the Pluggable TB3 to dual display port adapeter which looks physically. I found the big issue that it did not also supply power. And even with usb 3.1 on other port on my Dell XPS 13 2in1,I could not have dual displays and usb 3x devices and charging. Yes I realize with more port options on my 2in1, the best option for me was Dell TD 16 docking station.